Edith Pittenger is 102 years old. 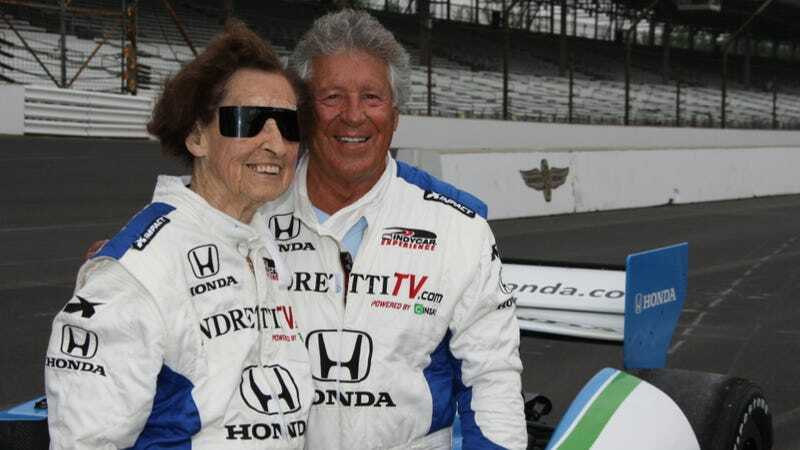 Yesterday, she took a ride around the Indianapolis Motor Speedway with Mario Andretti at the wheel of the IndyCar two seater. This is her second time behind the wheel. She was younger the first time: 96. In the lead up to the Indianapolis 500 on Memorial Day Weekend there are a number of festivities and events including practice for the race. One of the daily events are fan rides in the IndyCar two seater around the 2.5 mile oval. Six-years ago, Pittenger went for her first ride around the Speedway with two time winner Arie Luyendyk at the wheel. That was a Christmas present, and with it she became the oldest person to ever ride around IMS. She just broke her own record yesterday. So what did she think? "Let's do that again. That was fun! Come and try it." Edith is our type of speed freak. Let's hope she does it again when she's 108.